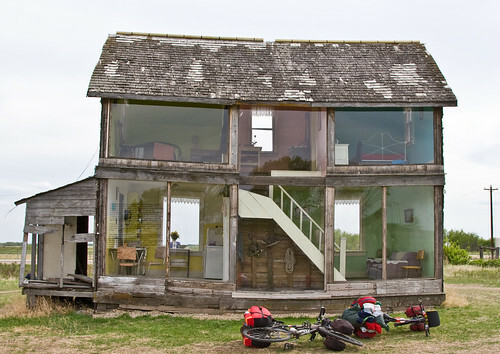 A few months ago I had written about 'Trestle Art - Converting Unsightly to Showpiece'. Here is another example of Converting Unsightly to Showpiece. 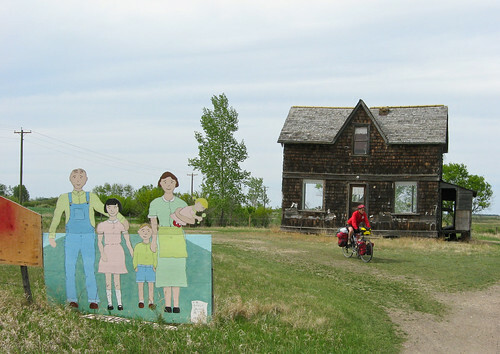 Heather Benning, a Saskatchewan artist came across an abandoned farm house near Sinclair, Manitoba, Canada and converted it into a full sized, giant doll House. She took about 18 months to complete the renovation and "The Dollhouse" was opened in June 2007. The interior has been painted with bright colours and the house has been furnished with the furniture of sixties (period when it was abandoned). Whole back wall has been replaced with Plexiglas - showcasing the interior and giving it an effect of a giant doll house. Other than the cutout people at the front of the property this house looks just like any one of the many abandoned farm houses in Saskatchewan and Manitoba. We only stopped because we thought we could look right through the windows to the trees at the back of the property. We turned our bicycles around (that is me on the bike in the picture above)and stopped to take a look. I'm sure glad we did -- this is a very interesting stop.